Loose anagen syndrome (LAS) is a rare congenital hair growth disorder that is caused by premature keratinization of the inner root sheath, which causes impaired adhesion between the cuticle, the sheath, and the hair shaft. It is characterized by short, fine hair of the entire scalp, but the other features of the hair, such as the structure and strength, are usually normal without evidence of increased fragility, breakage, or inflammation. 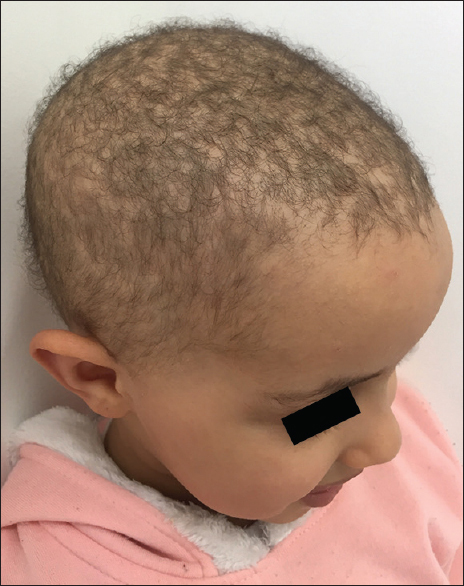 We report a case of a healthy 5-year-old girl with congenital isolated hypotrichosis due to LAS, successfully controlled by topical minoxidil. 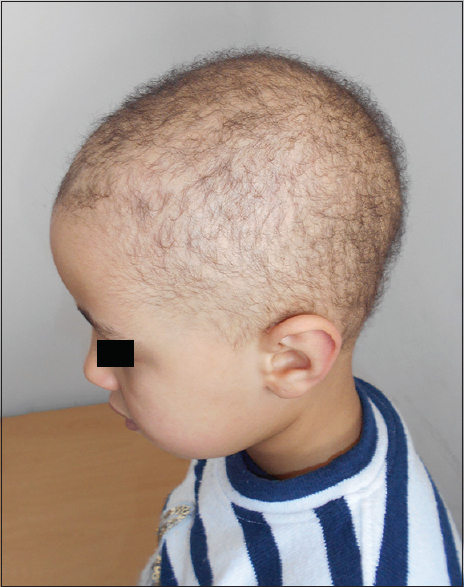 A healthy 5-year-old girl presented with a history of short and scattered hair since birth [Figure 1]. Her father was beardless since his teens. The parents reported that there was excessive shedding and poor hair growth and that the girl had never needed a haircut. Aggravating factors were denied, and the past medical history was uneventful. On examination, the patient was well-developed and did not present any abnormality except for short, dark, and thin scattered hair. The pull test was positive and painless. Body hair was normal, as was the rest of the physical examination. 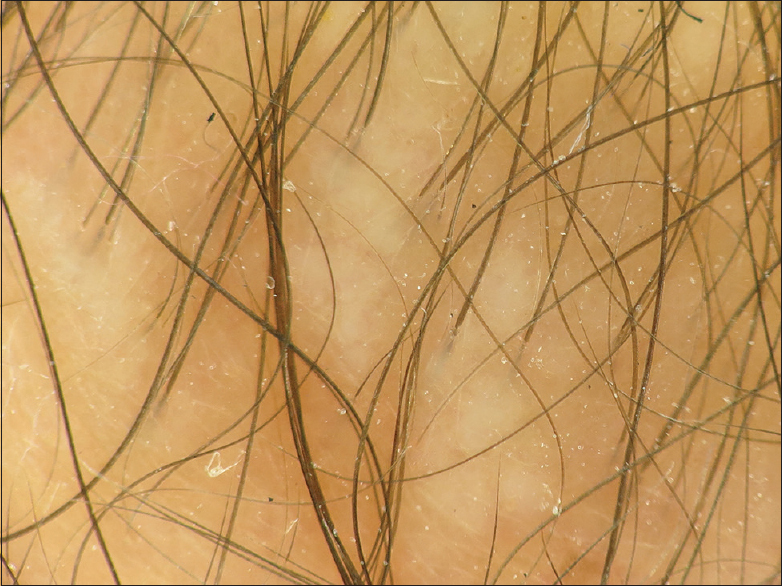 Trichoscopy shows a decreased hair density with most follicular units containing only one hair and some yellow dots [Figure 2]. 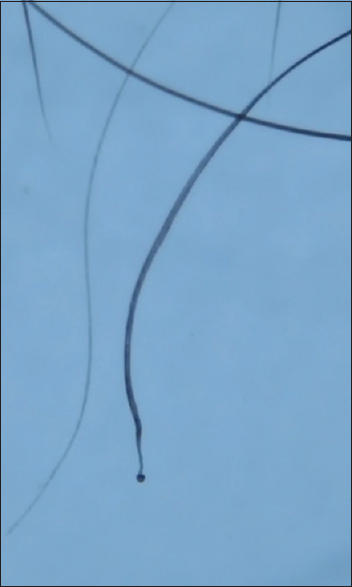 Trichogram of pulled hairs showed a 90% rate of loose anagen hairs (LAH). Furthermore, the proximal segment of some hair units appears distorted and twisted with ruffling of the cuticles [Figure 3]. Thus, the diagnosis of LAS was retained. Routine laboratory tests and genetic screening for related syndromes were negative. Treatment consists in topical 2% minoxidil associated with zinc supplementation which allowed a considerable slowing down of hair loss without improvement of capillary density or length [Figure 4] and a switch to a 5% topical minoxidil is considered. LAS is estimated to have an incidence of 2–2.25 cases per million per year. Cantatore-Francis and Orlow  in a retrospective survey, including 374 children with alopecia, finds an incidence of 10% (n = 37) among all the subjects. It has been reported to occur typically in young girls (ratio, 6:1) and in most cases, spontaneously improves clinically by adulthood or as early as adolescence. The most probable cause of LAS is premature keratinization of the inner root sheath, which causes impaired adhesion between the cuticle of the inner root sheath and that of the hair shaft. Thus, hair is pulled out easily and painlessly with minimal mechanical force, and it regrows quickly. The fast turnover of short hairs gives the impression of “short hair that does not grow.”,, LAS is thought to be an inherited condition in an autosomal dominant pattern with incomplete penetrance, although sporadic cases have been reported. Mutations in K6 hf of the companion layer of the hair follicle have been found in only some patients with LAHS, suggesting that mutations of other keratins of the inner root sheath may play a role. The familial history of our patient may comfort this hypothesis. Type C LAS, characterized by normal appearing hair with excessive shedding of LAH. The above phenotypes appear to be age-dependent, with Types A and B occurring in children, possibly evolving into the Type C phenotype around the age of 8 years and occurring in adults. According to this, our patient seems to be a Type A LAS. Although the clinical expression of LAH improves with age, it has been suggested that the phenomenon persists throughout the individual's lifetime. Thus, the use of topical minoxidil, mainly by increasing local blood flow, is promising in anecdotal reports and has been suggested as first-line therapy for children with clinically severe LAH., The most commonly used presentation is the 2% solution, but a recently reported case reported the successful use of a 5% over 28 months, resulting in quick, significant clinical improvement with no adverse effects. Cantatore-Francis JL, Orlow SJ. Practical guidelines for evaluation of loose anagen hair syndrome. Arch Dermatol 2009;145:1123-8. Tosti A, Piraccini BM. Loose anagen hair syndrome and loose anagen hair. Arch Dermatol 2002;138:521-2. Dhurat RP, Deshpande DJ. Loose anagen hair syndrome. Int J Trichology 2010;2:96-100. Chandran NS, Oranje AP. Minoxidil 5% solution for topical treatment of loose anagen hair syndrome. Pediatr Dermatol 2014;31:389-90. Chong AH, Sinclair R. Loose anagen syndrome: A prospective study of three families. Australas J Dermatol 2002;43:120-4. Sadick NS. Clinical and laboratory evaluation of AIDS trichopathy. Int J Dermatol 1993;32:33-8. Palit A, Inamadar AC. Adult onset loose anagen hair syndrome with alopecia totalis. Al Am J Med Sci 2008;1:58-60. Nunez J, Grande K, Hsu S. Alopecia areata with features of loose anagen hair. Pediatr Dermatol 1999;16:460-2. Mirmirani P, Uno H, Price VH. Abnormal inner root sheath of the hair follicle in the loose anagen hair syndrome: An ultrastructural study. J Am Acad Dermatol 2011;64:129-34.